If you think healthy eating can't include brownies, you've got another think coming. Brownies may not be the ideal health food, but they have a few surprising health benefits. In addition, simple recipe substitutions can cut down on the amount of fat and calories, making your dessert somewhat less sinful. Finally, there's a psychological benefit to eating the foods you crave, which can actually help you stick to your diet. Bring on the brownies. Chocolate contains antioxidant compounds known as flavanols, which may improve your body's ability to fight disease and aging. A 2006 review, published in "Nutrition and Metabolism" by Harvard University scientists found these flavonols may have even greater benefit; they appear to lower the risk of cardiovascular disease, blood pressure and cholesterol. A study, published in the "American Journal of Clinical Nutrition" in 2008, found eating dark chocolate and cocoa may indeed lower blood pressure. However, the addition of fat and sugar tends to counteract these healthful effects. "You can have it all — just not all in one day," Tufts nutritionist Susan Roberts told MSNBC in 2009. When you're trying to lose weight, MSNBC reports, a diet that deprives you of all satisfying foods might be setting you up for failure. Instead, some nutritionists recommend allowing yourself small "cheats." Eating a small brownie can curb your craving without blowing your diet. Just be sure to limit your snacks to 100 or 200 calories and stick to mostly healthy desserts like fruit and yogurt. Chocolate may be slightly healthful, but brownies are not so good; they're packed with calories, sugar and fat. A single coffee-shop brownie can contain over 400 calories and a whopping 20 grams of fat but provide few nutrients. The result: Even though that brownie provided a fifth of the daily calories for a normal 2,000-calorie diet, you may still feel hungry for more. The easiest way to avoid brownies' unhealthful aspects is to remove them by redesigning your brownie with better ingredients. 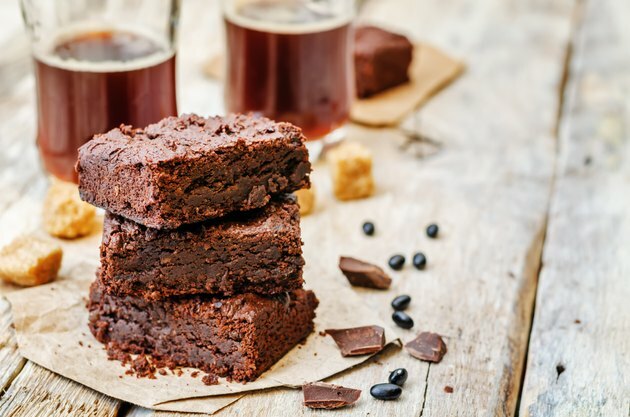 "Good Morning America" has published a brownie recipe that contains no added butter or oil, instead using silken tofu to provide a creamy, moist texture. You can also use applesauce or pumpkin puree in place of oil. Using high-quality dark chocolate can also help improve the quality of your dessert. Ultimately, there's no way you can eat brownies all day and stay healthy. However, baking healthier brownies -- and eating them in moderation -- is a safe way to keep your sanity while sticking to a diet. Susan Roberts recommends sticking to fruit on weeknights, then allowing yourself a rich dessert as a weekend treat. Berries have nearly as many antioxidant benefits as dark chocolate and are much healthier options. By making smart choices most of the time, you can indeed fit brownies into your healthy diet.